For communications service providers (CSPs), the journey toward network functions virtualization (NFV) will not end with virtualization. To truly benefit from this transformation, CSPs will need to automate their operations. Management and orchestration (MANO) of the virtual environment will play a key role in this automation. MANO will allow CSPs to automate the configuration of the NFV Infrastructure (NFV-I), service creation and network resource optimization. When this happens, CSPs can achieve both lower opex and improved service agility. As NFV moves out of proofs of concept and into production, many in the industry are now focusing their attention on how to operationalize NFV, including MANO. Indeed, during the spring conference season, numerous vendors, open source project leaders and CSPs celebrated their triumphs, and soberly described the challenges yet to overcome. CSPs are forging ahead with NFV despite a lack of standards for the MANO elements. The concerns about OpenStack as the Virtualized Infrastructure Manager (VIM) are largely resolved, with leading CSPs publicly discussing their implementations of it. Most concerns around MANO are less about architecture, and more about implementation. Open source communities such as Open Network Automation Platform (ONAP) and Open Source MANO (OSM) have expanded beyond the original work of the European Telecommunications Standards Institute (ETSI) to ensure that CSPs can create and manage services across virtual and physical domains. The ETSI NFV Industry Specifications Group (ISG) is also continuing its efforts and collaborates closely with OSM. Many in the industry are also investigating common information models that are needed to ensure the MANO elements can onboard and manage multiple vendors' virtualized network functions (VNFs) in a consistent way from a common architecture. Some CSPs and their suppliers expect that the cloud-native approach used by the hyperscale Web companies will also influence their future MANO architectures. 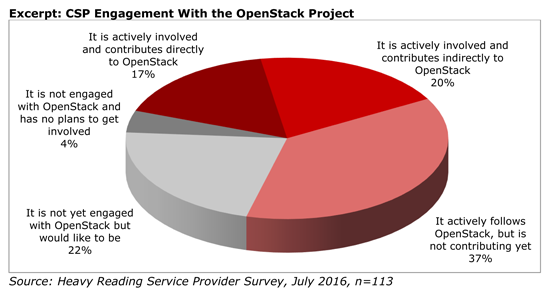 Most industry players now acknowledge that the industry has mostly coalesced around OpenStack for the VIM. CSPs can get vendor-supported distributions from numerous vendors, with Red Hat, Canonical and Mirantis being the most widely used according to the OpenStack Foundation. In March 2017, an ETSI NFV Specialist Task Force began working on an "OpenStack gap identification" project. In a survey Heavy Reading conducted for the OpenStack Foundation, nearly 75 percent of CSPs said they were actively following the project, and more than a third were contributing to it, as shown in the excerpt below. MANO & the Future of CSP Automation is published in PDF format.